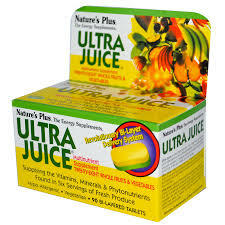 Nature's Plus Ultra Juice is a Multinutrient Supplement with Twenty-Eight Whole Fruits & Vegetables. It has a Revolutionary Bi-Layer Delivery System and contains most of the vitamins, minerals and phytonutrients found in six servings of 28 fresh whole fruits and vegetables. Ultra Juice is specially formulated for targeted release. Each tablet utilizes a revolutionary bilayered delivery system. This ensures that the global algae half, with its enzyme blend, dissolves rapidly and the vegetable half, with its probiotic blend, dissolves slowly. It has never been easier to obtain the healthful goodness only green foods can provide. Ultra Juice is more than just juice. It's a total food concentrate. Each tablet delivers the nutritional benefits of fruit and vegetable juice and provides a complete profile of protective phytonutrients found only in the skin, seeds, rind and leaves. Ultra Juice – The Next Generation of Whole Food Supplements! Process foods are so lacking in nutrition, and make up so much of the American diet. Taking a nutrient dense superfood like Nature's Plus Ultra Juice can provided us with many nutrients we may be missing. Have great energy and supercharge your health with Nature's Plus Ultra Juice. Nature’s Plus has enhanced health and changed lives for over 40 years, delivering energy, longevity and exhilarating feelings of peak nutritional well-being. At their mission’s core are pure, naturally therapeutic formulations that rise above the mediocre masses to deliver the exceptional results that you and your family deserve. Throughout the entire process for each naturally therapeutic supplement they make, they also perform hundreds of costly Quality Control steps that go “above and beyond” what is required by law. Plus, over nearly five decades they have honed their craft: Gaining valuable insight on which delivery forms, manufacturing techniques and nutritional combinations work best to support your health and well-being. Other Ingredients: Microcrystalline cellulose, di-calcium phosphate, stearic acid, magnesium stearate, silica, pharmaceutical glaze, fructooligosaccharides (FOS), polyphenols, lutein, beta-cryptoxanthin, lycopene, alpha carotene, sulforaphane, allicin, gamma-glutamylcysteines, triterpenes, polysaccharides, KS-2 peptidomannan, chlorophyll. Artificial colors and preservatives, Yeast, wheat, soy and milk. As a dietary supplement, take two tablets once daily.